Three Boy Circus: P&G and Thriftway Love the 12th Man! P&G and Thriftway Love the 12th Man! Disclosure: This is post sponsored by the partnership of Procter & Gamble and Thriftway. All opinions are my own. If you're a big Seahawks fan and local to the Seattle area, there are two events tomorrow sponsored by Procter & Gamble in partnership with local grocer Thriftway . 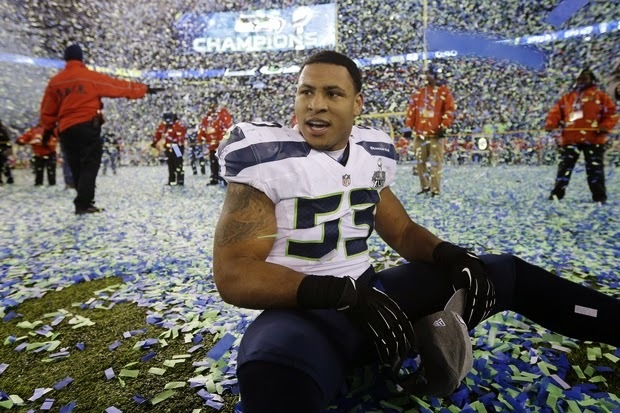 Malcolm Smith will be signing autographs and posing for pictures with fans. My sons are extremely excited to meet last year's Super Bowl MVP! Malcolm will be at the Vashon Island Thriftway (9740 SW Bank Road, Vashon, WA 98070) from 2-4pm December 9th. He will also be at the West Seattle Thriftway (4201 SW Morgan Seattle, WA 98136) from 6-8pm December 9th. Procter & Gamble and Thriftway have partnered up to help make your next NFL tailgate party a total victory! Your home town retailer offers great values on brands you love – making it easy and affordable to throw a winning tailgate get-together with family and friends! My family loves using P&G on game day. We start the day off with Head & Shoulders shampoo and Herbal Essences body wash. We also love Secret and Old Spice deodorants and swear by Crest toothpaste! Tide helps to keep our Seahawks gear looking great! During the game, Bounty paper towels are a must-have when we need a quick clean-up! In addition to meeting Malcolm, P&G has a special offer tomorrow only for Thriftway customers! Buy $25 in P&G products and receive a FREE Seattle beanie hat! Thriftway will also be giving out free Seahawks eye black stickers! Take advantage of this great Seahawks deal at the two Thriftway locations tomorrow!